Applications must be received by May 10, 2019. You must be a current BIANYS member to apply. If you are not a member, please complete a membership form and send it with your scholarship application. First time applicants will receive priority over applicants who have received scholarships in the past. Funding is limited – please apply only if you are experiencing severe financial need. 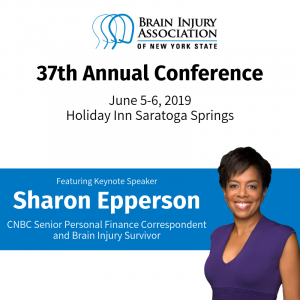 Annual Conference registration for both June 5 & 6, 2019. Meals are already included with the conference package. Additional meals are not reimbursed. Conference registration and meals for a personal aide (if required). Qualified recipients may receive a stipend of up to $100 to offset hotel or transportation expenses. Applicants must live more than 50 miles away from the conference location to qualify for travel/hotel stipend. Please fill out the Scholarship Application below or download and print out an application. No information will be given out by telephone regarding the outcome of scholarship decisions. Letters announcing scholarship approval or denial will be sent as soon as decisions are made. Travel and lodging are the responsibility of the conference attendees. Please note that the amount of the scholarship reimbursement available may not cover all of your conference expenses. Please contact: Saratoga Springs Holiday Inn 1-800-465-4329 to reserve your room directly. Tell them that you are attending the Brain Injury Association Conference to receive a reduced room rate (hotel code is IJ4). Will your aide require a scholarship for their meals? If you are bringing an aide, what is their name? Do you live more than 50 miles from Saratoga Springs? To be eligible for a travel stipend, you must live more than 50 miles from Saratoga Springs.